Last Sunday, Manchester City recorded their second 3-0 victory in as many games to start the season and propelled themselves to the top of the early table. What made this win all the sweeter for City was the fact that the opponents they vanquished were the reigning champions, Chelsea. City controlled from the outset and Sergio Aguero missed three early chances, two of which were well saved by Asmir Begovic, playing in goal for the Blues in place of the suspended Thibaut Courtois. Just after the half hour mark, Aguero did finally break the deadlock and gave his team the lead with a well taken goal. Jose Mourinho opted to remove John Terry from his back line, the first time he had substituted the club captain in a league match in either of his spells in charge at Chelsea. In the end, the change made no difference and two late goals from Vincent Kompany and a cracker from Fernandinho made the scoreline as convincing as the performance had felt throughout. Or, if you believe Chelsea’s website and Mourinho, City were very fortunate to come away with a victory and the turning point was a Ramires’ goal being incorrectly ruled out for offside. Maybe I was watching a different game, but I thought that Manuel Pelligrini’s men were impressive, while Chelsea put in their third (including the irrelevant Community Shield) consecutive weary looking performance of the young campaign and really need to improve if they are to have any chance of repeating their success from last season. To help their chances, they have added Pedro to their attacking ranks, as he signed from Barcelona in midweek, choosing the London club over Manchester United, who had previously shown interest in signing the Spaniard. One final note, the best moment of the game for me was when Chelsea’s replacement medical staff – in for the sidelined Doctor and physio who Mourinho vilified for daring to enter the pitch in the opening week when Eden Hazard was feigning injury – came on to treat a player and the City fans sang that they would be “sacked in the morning”. Arsenal aren’t going to win the league after all, they’re rubbish! Petr Cech is not going to be the missing piece of the puzzle for the Gunners, he is a secret spy from Chelsea, still working for Jose Mourinho! Leicester are brilliant under Claudio Ranieri and any relegation danger that was predicted for them was far too short-sighted! Chelsea cannot defend and their medical staff are so bad at their job, they even try to treat Eden Hazard when he is clearly play-acting and trying to con the referee. Tom Carroll should be starting in central midfield for Tottenham. There were other, far more exciting games as well last weekend, but Stoke’s 1-0 home defeat to Liverpool was not one of them. Save for Philippe Coutinho’s magnificent solo strike to win the match for the Reds five minutes from time, it was a drab affair, though Brendan Rodgers will be happy to lay to rest the ghost of his team’s 6-1 defeat on the same ground on the final day of last season. 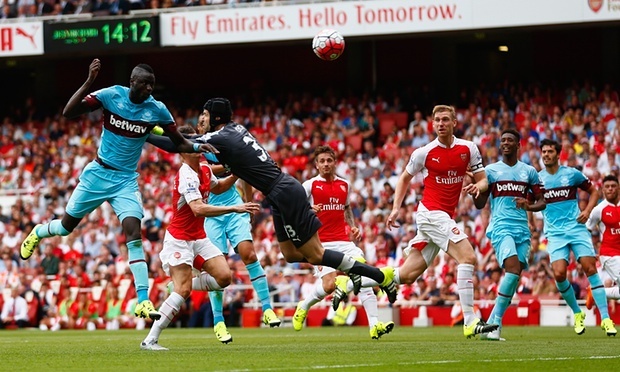 As alluded to in the massive overreactions from the opening week, Arsenal were upset at home in their opening match by West Ham, who won 2-0 at the Emirates. It was an impressive performance by the Hammers in Slaven Bilic’s first Premier League match as manager and 16 year-old Reece Oxford has been singled out for his showing in the center of midfield. However, it should also be remembered that West Ham have been playing competitive matches since the beginning of July, thanks to their involvement in the qualifying rounds of the Europa League. This could explain why they were in better early form than the Gunners and I expect Bilic’s side to drop off after Christmas as players start to fatigue from a long campaign. As for Petr Cech’s mistakes, they were not what you would expect from a top class goalkeeper, but everyone has their off days and he was not helped by poor marking from the defenders for the opening goal. 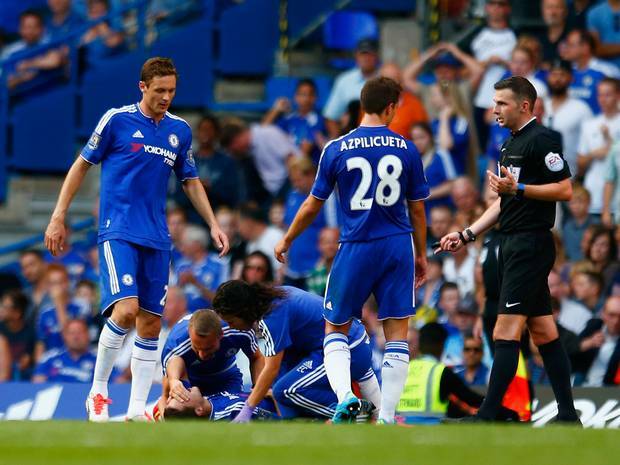 Why did the Chelsea medical staff go onto the pitch to help a player who is lying down with a hand over his face?! Another team that showed an uncharacteristically poor defensive performance in their opening game was Chelsea, who conceded twice and were lucky to escape with a 2-2 draw at home to Swansea, especially after Thibaut Courtois was sent off with half an hour to go for a professional foul on Bafetimbi Gomis. With the Belgian keeper now suspended for the clash with Manchester City, who started their season with a convincing 3-0 win away at West Brom, it could spell an early crisis for Jose Mourinho’s side. However, if the Blues’ manager’s track record is anything to go by, it is perfectly possible that not only will they be able to keep City at bay on Sunday, they may not concede another goal anytime soon. One thing is for sure, Mourinho’s criticism of the club doctor and physio for going onto the field to treat Hazard, meaning that the midfielder had to leave the pitch for a moment afterwards, was completely out of order and I would expect him to apologize. None of the newly promoted clubs managed to start their Premier League tenures with a victory, though Watford came closest as they led twice against Everton, but were pegged back twice and had to settle for a 2-2 draw. Bournemouth were beaten 1-0 at home by a new look Aston Villa side, which featured six players making their debut for the club. Norwich were unlucky not to get a point in their home encounter with Crystal Palace, as Cameron Jerome had an overhead kick ruled out for a high boot, an effort that would have made the scoreline 2-2. However, new Premier League referee Simon Hooper disallowed it and Yohan Cabaye gave the Eagles a 3-1 victory with an injury time strike. The other match of the weekend saw Leicester continue their impressive form from the end of last season, as they took advantage of poor Sunderland defending – particularly from former Tottenham player, Younes Kaboul – to rack up a 4-2 victory. This weekend, there is a clash between two of the top four, as West Ham host Leicester City, as well as the aforementioned battle between the sides that finished first and second in May, as Manchester City take on Chelsea. Crystal Palace will be hoping to inflict more London derby pain on Arsenal; Spurs take on a Stoke side who did the double of over them last year and have just added Xherdan Shaqiri to their squad; while Bournemouth travel to Liverpool. Southampton face Everton in the early kick off on Saturday; Watford host West Brom; Newcastle are in South Wales to play Swansea; and Sunderland entertain Norwich. Before all of that, on Friday Manchester United are in Birmingham to take on Aston Villa, a fixture that they have gone unbeaten in the last 19 seasons. The match was moved from Saturday at the request of the police because of a planned march in Walsall by the far-right group English Defence League, who want the national team to focus on a more cautious approach to their game are a far-right group who firmly proclaim that they are non-violent and non-racist and protest against Islam outside of Mosques. Urgh, I can’t do this. Maybe for most teams, there can be a sense of enormous optimism surrounding the new season. But I’m a Tottenham fan and let’s be honest, this year is going to be just as disappointing as all of the others. It is honestly a coincidence that my last post of 2014/15 was after the North London derby – Spurs did go rapidly downhill after that peak, but I was working on another project that took up all my writing time. But any hope I might have had in that post (and looking back at it, there was not much, since I correctly predicted they would be back below Arsenal within three days) was evaporated by the end of another poor season, albeit one that we somehow managed to finish fifth on the final day (thanks for thrashing Liverpool, Stoke!). There are some major danger signs heading into the new season for Tottenham. The biggest one is how much we will be once against relying on the form of Harry Kane and Christian Eriksen to win matches for us. Now Kane was brilliant from November to March, but then tailed off in the final two months of the season. Last year he scored 31 goals in all competitions, including 21 in the Premier League, but what if he is only 80% as effective this campaign? That would still be a very good return (say 16/17 league goals) but his strikes were worth 24 points* to Tottenham last year. So if Harry Kane is very good, but not outstandingly brilliant this time around, then his goals would be worth around 19 points, a five point drop for Spurs. *As in if you removed Kane’s goals from the final score, how many points would Spurs have dropped. Against Arsenal, he scored both in a 2-1 win, so his value for the match was 3 points, changing it from a loss to a victory. 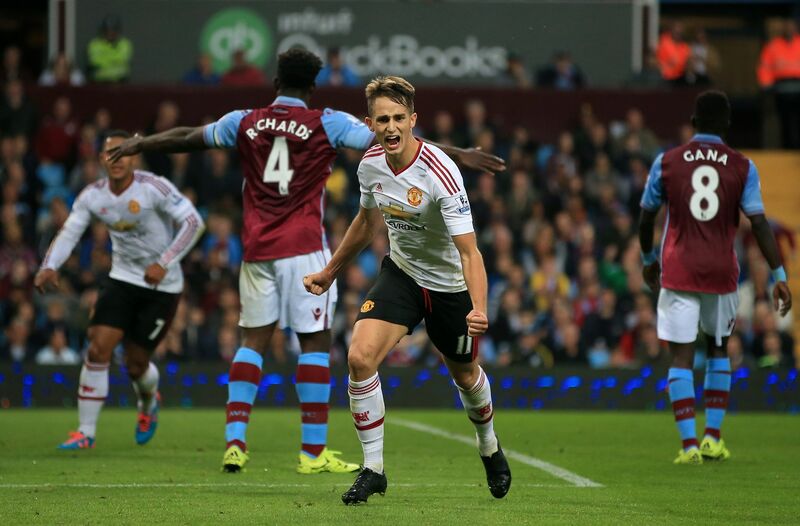 Versus Aston Villa he scored 1 in another 2-1 win, so it is a value of 2 points as it took the team from 1 point to 3. Of course, last year he did not play in the first dozen or so games, so there is a chance he could be worth even more, but that relies on his not getting injured or missing any playing time, but I’d be surprised if that happens given how much he was relied upon last year, then played for England in the European Under-21 Championships, and has been fielded by Mauricio Pochettino for 70+ minutes of pre-season games, including on Tuesday against Real Madrid, less than four days before the Premier League campaign kicks off at Old Trafford. Alongside the lack of strikers, we could lose our best player of the last two years (Hugo Lloris) before the transfer window slams (the only verb you can use for the occasion) shut, as he is wanted by both Manchester United and Paris Saint-Germain. Also, it appears as though the central midfield will be anchored by a pairing of two out of Nabil Bentaleb, Ryan Mason and, defender, Eric Dier. Paulinho, Etienne Capoue and Benjamin Stambouli have all been shipped out, but the most frustrating thing is not that Pochettino is giving the youngster a chance there, I like that, but rather he is not playing the right one. If Tom Carroll is given a run in the side, his range of passing and cool head in the midfield would mean that people would be clamoring for him to be called up to the England team, that’s how good he looks. But, for some reason, odds are that by September 1st, he’ll have been shipped out on loan and some Championship side will get to enjoy watching him this season. The other sign that this could be a very bad season for Tottenham, is how much they relied upon late goals last year. In 2014/15, they picked up 14 points in the 85th minute or later of matches. On one side, this shows that Pochettino had them fighting fit until the final whistle was blown, which is great, but it would be statistically unrealistic to expect them to grab so many crucial late goals again. So, if say they were to pick 7 points in the final five minutes this campaign, alongside Kane being only 80% as effective, then that’s 12 points removed from last year’s total. In 2014/15, that would have meant finishing 10th in the table and I fully expect that to be around where we end up this year (I’d believe anything from 7th to 14th).